Article by Mike Kepka, SF Chronicle. Cello Madness Congress: Winter Warmer! Hello Cello lovers! The big day is tomorrow. The last Cello Madness Congress of the year will be December 10 2014. That's tomorrow! You can get tickets in advance at cellomadness.eventbrite.com or at the door. $10-20 sliding scale, cash only. GoPro, makers of the popular sports/action video cameras, are coming to take some footage and make a music video! Mike Kepka from the San Francisco Chronicle will be there covering the show! This is one you are not going to want to miss! "The Cello MADNESS Congress: Winter Warmer!!" 1 block from Powell St BART - take public transit! An electrifying trio, StringQuake brings a new sound to today's world music scene. With electric lever harpist, Amelia Romano, cellist, Misha Khalikulov, and percussionist, Josh Mellinger, StringQuake's repertoire draws inspiration from the music traditions of the Americas, Greece, Africa, India, European classical, and the musical masters who have emerged from every corner of the globe. The groups unique instrumentation, original compositions, and dynamic arrangements give spice to their sound. Dave and Bruce have been making music together for years as part of a band in the Eastern Sierra, and this will be a very special duo performance of brand new tunes, improvisation, and experimentation. 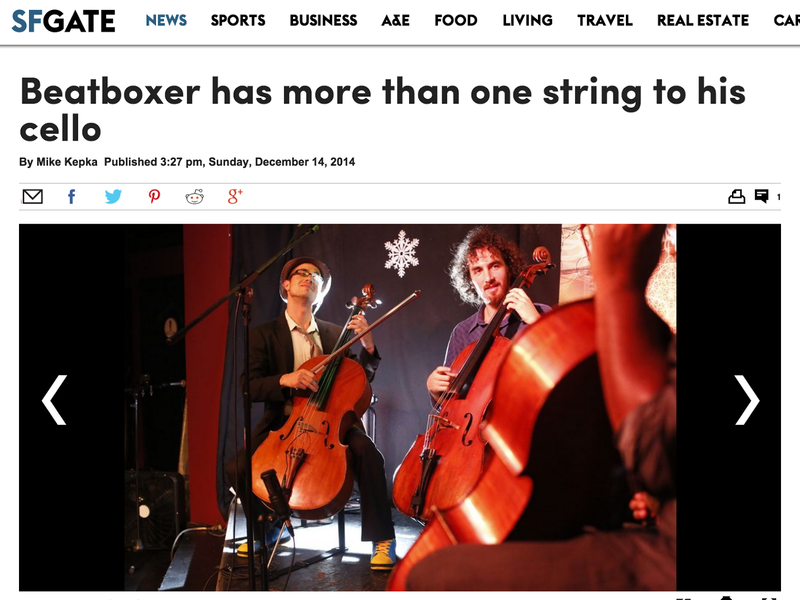 The Silver String duo is a bay area violin and cello duo that mixes different styles of music. Their mission is to inspire, entertain and create, using their hearts and their minds. Some of their musical influences have come from the world of classical, jazz, movie, pop, improv, and video game music. They are never afraid to try something crazy. There's only 75 tickets available. Tickets are $8 to $20 sliding scale, so if you're doing alright, support the art. First come, first served. Doors at 7:30 pm show starts at 8:00 pm .